The collection of stories, produced by Andi Arndt, is performed by the author along with a stunning cast of Nashville stars, including Janis Ian, Mary Gauthier, Telisha Williams, Amy Speace, and Louise Mosrie. 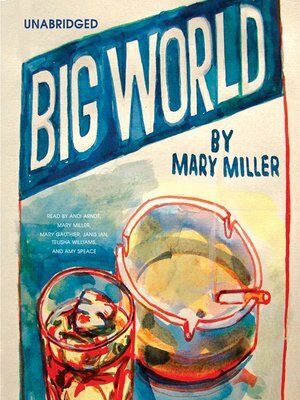 The characters in Mary Miller's debut short story collection, Big World, are at once autonomous and lonesome, possessing both a longing to connect with those around them and a cynicism regarding their ability to do so, whether they're holed up in a motel room in Pigeon Forge with an air-gun-shooting boyfriend, as in "Fast Trains," or navigating the rooms of their house with their dad after their mother's death as in "Leak." Mary Miller's writing is unapologetically honest and efficient, and the gut-wrenching directness of her prose is reminiscent of Mary Gaitskill and Courtney Eldridge, if Gaitskill's and Eldridge's stories were set in the South and reeked of spilled beer and cigarette smoke.